You ride at your own pace. You ride with your friends. You ride for the sheer joy. You ride. Short distances, long distances, epic climbs and sweeping descents. In rain and in sun. Pavé, strada bianca, city streets, fire roads and goat paths. It's not a race, it's not the destination. It's the journey. Ride your journey. I purchased this frame almost a year ago direct from you guys and have been slowly accumulating parts. I finished the build a few months ago and have been riding it hard since. For the past few years I have been looking for the one bicycle that would satisfy 90% of the riding I do: commuting, long distance riding/randonneuring, gravel and forest service road riding. One day I happened to see your Velo Routier in an issue of Bicycle Quarterly. It finally clicked that this was my ticket to the low-trail world of Alex Singer and Rene Herse without spending my life savings. Sure enough, its a bomb proof adventure machine with a surprising amount of speed. I built it up with the stock Cycles Toussaint crankset (I love that there is no branding) and headset, added some Nitto and Velo Orange components, eBay Ultegra derailleurs, Gevenalle cyclocross frankenshifters, and of course Mafac “Raid” center pull brakes. The 50mm VO Snakeskin fenders were a squeeze, but I have had no issues with tire-fender clearance on a multitude of gravel and dirt surfaces. I do wish I could put larger fenders on the frame so I had more wrap-around (I guess that is called the 2.0). The wheels are Velocity Synergy (O/C rear) laced to a Shutter Precision front and Ultegra rear shod with Compass Babyshoe Pass 42mm tires. For the quintessential rando bag I ordered a custom bag from Treetop Bags in Chicago, Illinois. These bags are not very well known and are very affordable, while still being hand-crafted. I wanted a rack that sat lower than the stock Cycles Toussaint rack so I could direct-mount the fender. I didn’t want to have a custom rack made and took a risk on the Compass CP1 center-pull rack after some not-so-precise on screen measurements. The rack stays ended up being only 3mm off and I was able to get the fit with a cheap tubing bender. The decaleur is made from a P-clamp, U-bolt, and paint stir stick inside the bag for lateral support. At $10 it’s a fraction of the cost of a production decaleur and just as sturdy and light. I wanted dynamo powered lights front and back. But, I am not a fan of the zip tie method for wiring stock frames, especially with a taillight. It looks tacky and unfinished. To “hide” the wire, I glued it to the inside of the rear fender with automotive grade black silicone. I then ran it through the chainstay bridge hole on the fender and secured the wire to the BB cable guide with a washer. Next, I ran the front derailleur cable and the tailight wire through some shrink tubing up along the down tube (I stole the idea, works great) and then in and out of the front fender to the headlight. For the dynamo wiring I fished the wire through the rack boss on top of the fork crown, down through the blade, and out the vent hole. Unless you are looking for it, the wiring is all but invisible! I attached some pictures as well. Thanks for the awesome ride! The protoype is a 650B frame based on the same low trail geometry as our cro-mo 650B Velo Routier frame. .Like the Pavé Prototype, it is made from Carpenter stainless steel with a twin plate crown fork, disc brakes and 1-1/8″ Aheadset. We stuck to the tried and true Velo Routier V1 geometry and made a few improvements to increase fender/tire clearance. 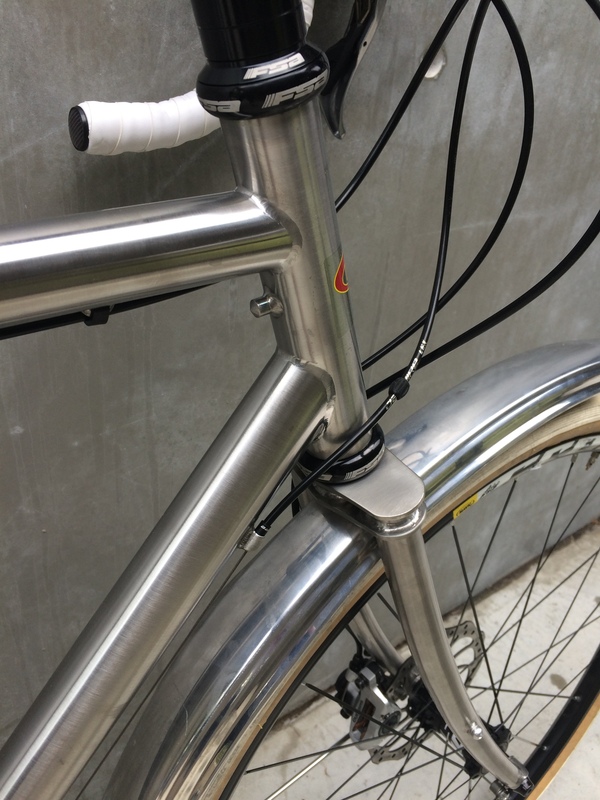 It has clearances to accommodate 54-55mm wide fenders and braze-on fixtures to attach fenders and racks to. 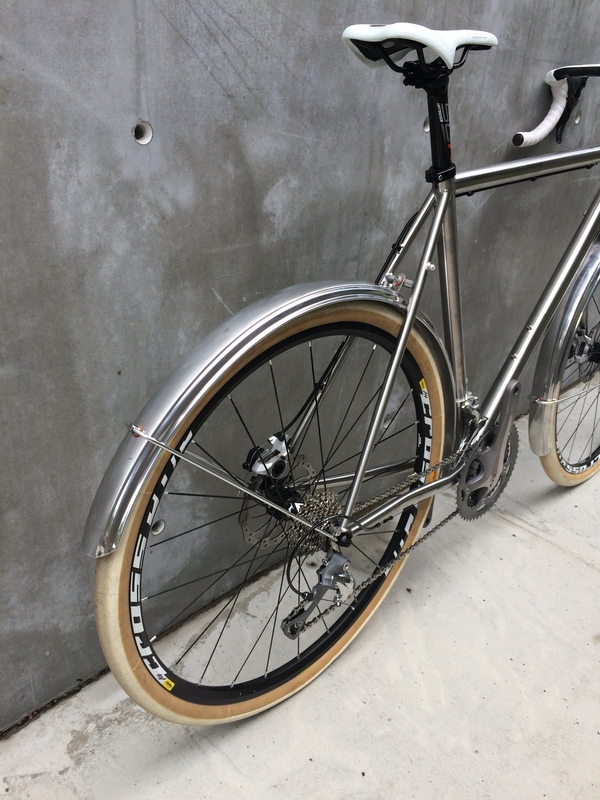 We fit up our prototype with 52mm Velo Orange Zeppelin fenders. A rfear fender attachment to the underside of the seat stay bridge was spec’d but missed on the fabrication of the prototype. 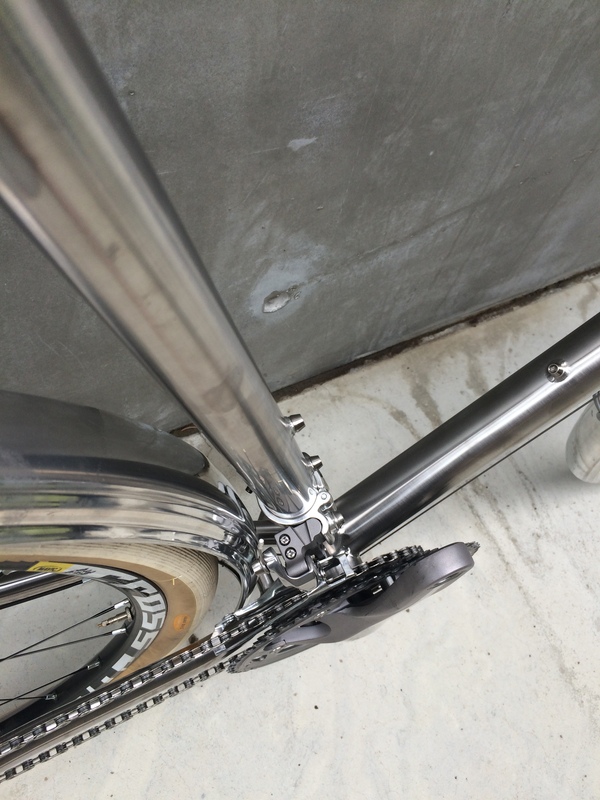 We deigned an all stainless steel with a twin plate fork crown similar to the Pavé. Unfortunately, the prototype is also missing the top of the crown fittings. Bare frame weight is 1998 grams vs. 2177 grams for medium cro-mo VR 54 cm frame and the bare fork weight is 926 vs. 958 grams. Even accounting for the extra weigh of the disc brake fittings, it not a huge weight saving for you weight weenies but we think the ride is super smooth and frame is bomb proof ! With a bit of refinement, we think we might be able to shave another 50-70 grams off but not the at expense of durability. 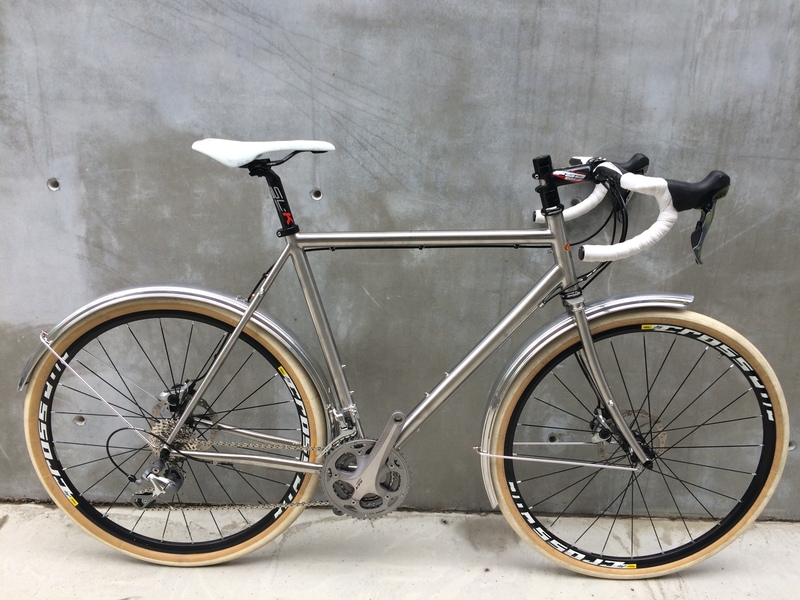 The Pavé protoype is at Free Range Cycles in Seattle for the next couple of months and the stainless steel VR prototype should there in 2-3 weeks. If you are in the area, drop by and say hi to Kathleen. Give our prototype a good test wring out – we really want to hear your comments and suggestions! The Velo Routier V.2 have arrived! The V.2 frames, after a long and winding journey (don’t ask! ), have arrived safe and sound. We will have photos up, our on-line store updated by this weekend and stock shipped out to our dealers in 1-2 weeks time. We finally have some news! increasing the rear axle dropout spacing from 130mm to 132.5mm to allow the more commonly available 135mm hubs and wheels sets to be fitted. instead of vertical, the V.2 will have adjustable horizontal rear drop outs which will allow for internal hub and fixed-gear builds. the front fork crown will now have an underside 5mm threaded fitting to allow fenders to be attached to the crown directly. the indent diameter of the chainstay and the clearance of the seatstays wil be increased from 52mm to 56mm to allow for wider fenders and tires. In a fit of madness, we also have decided to have few frames in each size made as a “no braze-on frame” – without pump, brake, brake cables, dérailleur cables or shifters bosses and with 2 sets of bottle cage braze-ons on the seat and down tubes and fender attachments. You can have any colour as long as it is French Tricolour-esque blue. Price tentatively will be $525.00 USD. With a bit of luck we hoping to to have them available in our on-line store and in local dealers by May. Cheers and Ride Your Journey! BTW We still have a few (very few) 51cm and 60cm creme colour V.1 frames left in-stock. We’ve had some questions about fenders and tire clearance so thought we would write a quick blog post. There is an ongoing debate “out there” about the balance between safety, tire clearance and aesthetics. Lower clearance between the tire and the fender looks slick but the chance of a piece of debris lodging between the two increases. We have set up the Velo Routier with a the higher clearance but with an eye to good aesthetics. 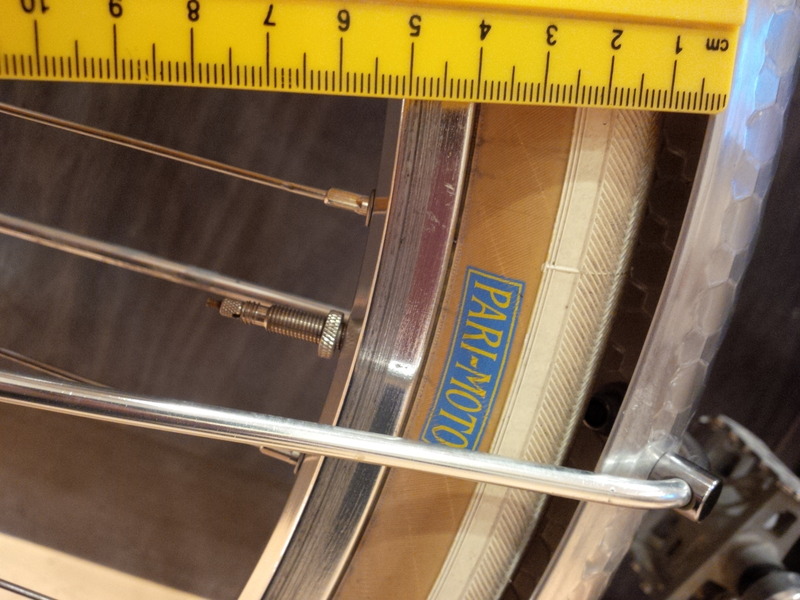 Our current bikes come equipped with 38mm Pacenti Pari Moto 650B tires under 46mm wide fenders. The clearance between fender and tire is approximately 10mm. The tires also have no problems fitting between the chain stays. 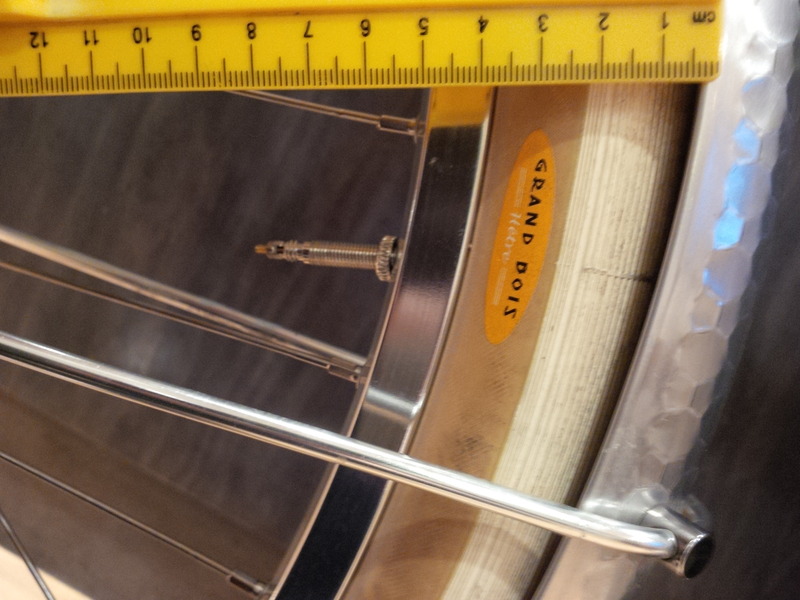 We have had enquiries about fitting 42mm Grand Bois Hetre 650B tires. These tires will fit. We have tested a set on the Velo Routier on the country back roads of Alberta Rockies without problems. The clearance will only be about 5mm under the 46mm fender. A 50mm fender would probably be better for clearance but it would be a very tight fit on our bikes. See the attached photos. 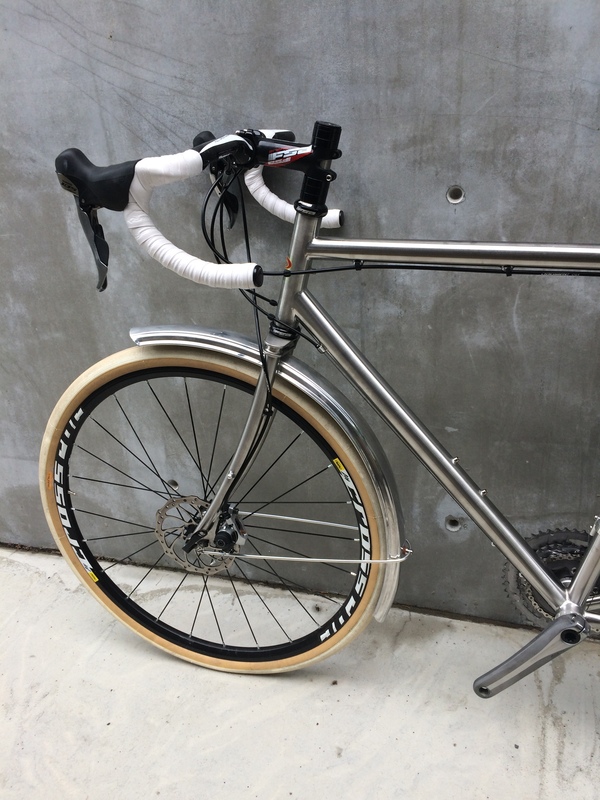 Please feel free to send us your pictures if you ride our bikes with 50mm fenders. As we finalize our 2015 design in the next couple of weeks, we are considering “squishing” the chainstay a touch more. The final decision will be based on practicality, ridability and safety. Enjoy the journey, Angus. I spent the last two weeks with my family; Christmas travel and cheer, pond hockey, skiing, reading, board/video gaming and doing personal bike builds which I will try to report on soon. We are back to business and we will try to respond to your orders and e-mails as soon as we can. Before the holiday break, my business partner and friend, Jason Wall decided to leave Cycles Toussaint for personal reasons. Running a super-niche bicycle business with him has been great and I wish him all the best. With Jason leaving, I had to defer re-ordering frames while I re-appraised how to carry on and I had a reasonable stock to carry through the spring. Or so I thought. The review in Bicycle Quarterly’s Autumn 2014 Vol. 13 No.1 issue of Velo Routier resulted in flurry of late season sales in December that has left us sold out of all our 54 and 57 cm frames, all of our Citie bicycles, leaving a few 51 cm and 60cm frames and 60cm Velo Routier bicycles in stock. On a positive note, Angus Cowan has joined Cycles Toussaint as my business partner. The thought of running Cycles Toussaint solo was a daunting proposition and I am excited to have Angus on-board. Angus is active in the local racing scene with the ABA and is in Milton this week with his son Alec who is riding with Canadian national team at the Track Nationals. He will be back in Calgary with me next week and we hope to report on our plans for the next batch of Velo Routier frames; proposed changes and expected availability. Coincidentally after almost two years of back-and-forth and out-of-the-blue we just received word that our Reynolds 931 stainless steel 700c road frame and 650b Velo Routier prototype frames have finally been fabricated and should be ready for road testing at the end of the month. Look here to this blog for full specs, photos and a first ride review in early February. Happy New Year and Ride Your Journey! Our Velo Routier frame was recently reviewed in the Bicycle Quarterly’s Autumn 2014 Vol. 13 No.1 issue . The test bicycle was generously provided by our Seattle dealer Free Range Cycles. There are a couple of points that came up in the review I would like to add to. Jan noted that our frame was very similar to the first generation Kogswell Porteur/Randonneur. I was aware of the Kogswell bicycle story up here in the Great White North but we did not know any of the details of the bicycle design except snippets gleamed from the internet. Our initial prototypes were designed from several vintage low-trail 650B bicycles and 650B conversion bicycles that I either owned or had access to and from information from various sources including Jan’s highly informative articles in BQ. Jan noted a few details such rack tabs that were pressed and that front rack sat high on the front wheel. We were trying to create a introductory product that filled the entry level randonneur bicycle niche and as such we made design decisions on construction details such as pressed tabs to keep prices down. As for the high rack, we are working on improvements for the future and are certainly taking that observation into consideration. 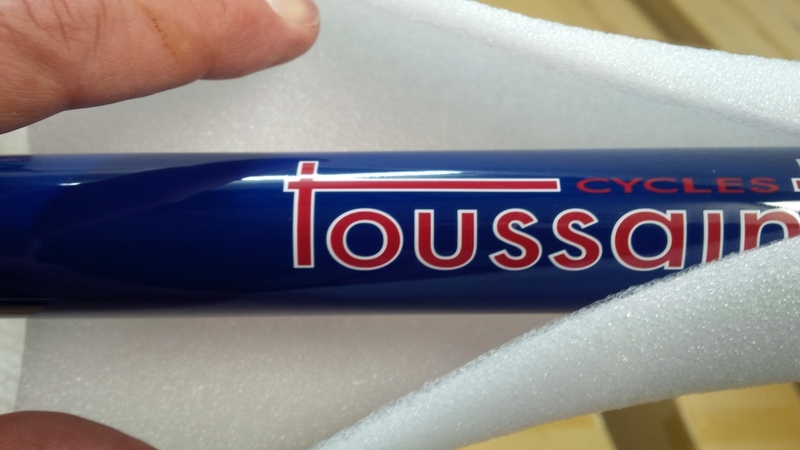 Our down tube was deliberately specified with a stouter diameter and wall thickness on our 57cm and 60cm frames. We debated whether we should go lighter but decided to play it safe out of concern for high speed shimmy. The 51 and 54 cm frames have a lighter 0.8-0.5.-0.8 28.6mm diameter downtube and the 54cm moderately planes in my experience. I am a big supporter the concept of planing and designing a low volume production frame with this in mind is still a work in progress.